Over the last week, I’ve posted vegetarian Thanksgiving recipes for cranberry sauce with a twist, colorful mashed potatoes, aromatic stuffed delicata squash, an apple crisp made with ground almonds, a bright carrot soup with leeks and thyme, and a silly po-turkey. For my final recipe in this pre-Thanksgiving (predominantly local food) extravaganza, I would like to share a very special dessert we made this week. My mother in law returned from a visit to Whole Foods raving about poached pears she’d seen. Waxing poetic about the saffron infused, golden pears, we had to make some of our own. With her suggestion of creme fraiche, I was definitely sold. The next day Marc and I took a jaunt down to the market and discovered some gorgeous colossal bosc pears. That night a delicious meal came together of roasted cauliflower and garlic, and baked sweet dumpling squash. For a little more color, we threw together our vegetarian Caesar salad (not complete without fresh garlic croutons made from a local bakery’s chewy sour baguette). Marc spent a good half hour researching poached pear recipes on the web. Our usual modus operandi is to research a particular dish, and then hybridize a bunch of recipes to fit it to our tastes. That night Marc found several from epicurious.com that looked promising, but all the recipes included way too much wine, in my opinion. One called for an entire bottle. So, we tinkered and played with quantities, and decreased the sugar, coming up with this tasty treat. The pears take a bit of time to make, but it’s so incredibly easy, it will look like you slaved over them for hours. It’s a sophisticated, even romantic dessert. The saffron turns the pears a brilliant golden hue, and the vanilla seeds speckle the syrup with color and flavor. Because of that, this is one of the very few occasions where I would recommend peeling fruits or veggies. The flavors are exotic and layered, yet familiar, and the creme fraiche garnish adds a creamy tang to this sweet aromatic delicacy. When my mother in law tasted the syrup, her eyes widened and she exclaimed, “How unusual!” One of the wonderful benefits of this confection is how easily you could scale it up or down…an intimate evening for two…or a raucous holiday celebration for 20. This is the kind of dessert that looks like you worked a lot harder than you did. Easy yet superb for the most refined palate. With a knife, split the vanilla bean lengthwise and scrape all the tiny seeds into a heavy large saucepan. Add in the vanilla bean halves and everything but the pears and creme fraiche. Stir over medium heat until sugar dissolves and the mixture comes to a simmer. If you make this a day ahead, you can put the pears back into the liquid and let them cool and soak overnight. The golden saffron color will deepen in the pears with time. 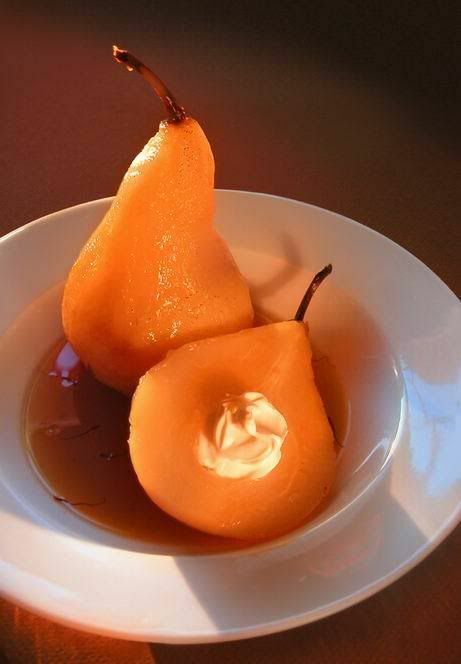 Either way, serve the pears warm, garnished with the creme fraiche and a drizzle of the syrup. Bri. What a great recipe and photo. You make me want to go back to those autumn days! Can I use say these make me sooooooooooooo hungry! Stunning. Brie – Thanks so much! Marc never ceases to amaze me. So glad you stopped by. For days I’ve been intending to check out what fun furry critters you’ve been working on lately. I promise I’ll stop in. these look so lovely. wil it taste sweet or tangy? what a stunner. bri, have you tried adding a dash of cognac along with the wine? it enhances the pear flavour. Nags – Thank you! The syrup is sweet, but not as intensely as say, gulab jamun syrup. The creme fraiche or sour cream, or yogurt would bring in a little tangy accent. Bee – Thanks! I wish Tastespotting thought so. I don’t know what their criteria are. Anyway, I haven’t tried it with cognac yet. What a great suggestion. I’ll have to get my hands on some for the next time we make it. This looks absolutely fantastic, Bri – next time I want to impress my guests with dessert, I know where to go! Wow i wouldlove to have them. dang — why didn’t I see this before I decided on pies for dessert today?!?!? I am impress,this desserts looks absolutely gorgeous. I must to try this. Lovely photo too. Patricia – Thanks! I think you really will impress your friends with the pears. I think they’d be delicious served with some angel food or bunt cake as well. Happy Cook – Thank you! Gigi – Sorry, it took me a while to get the recipe up, before T-Day. But, I’m sure there will many opportunity to entertain during all the holiday celebrations of the next month or two. Happy Thanksgiving to you as well! Wow, gorgeous photo. I seem to have editor privileges on Tastespotting; I’ll add it for you if you like. This is looking close to what I’d like to do, thank you. As for the creme fraiche, I like to add a tad of sugar, vanilla, and balsamic vinegar to it and whip it together mildly with a fork. Tastes amazing. Oh, good! Monique ~ Glad you stopped by to let us know. I need to give this a try as well. Remember suggesting an idea for this to Bri & Marc, but haven’t actually cooked the pears myself. Share a photo of your creation if you have a chance. Will be fun to see. Bon Appétit! » Blog Archive » DMBLGIT - December… The Results Are In.